Who Is Digitally Excluded, Why And What Can We do About It? In 2013 the Trust published our popular report Across the Divide, which examined digital exclusion in Glasgow. 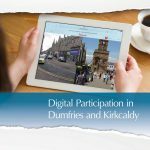 This new research, produced in partnership with Ipsos MORI, examines the same issues in Dumfries and Kirkcaldy – looking at the barriers to digital participation and how these can be best addressed.